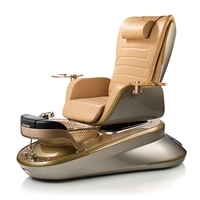 Audrey pedicure chair and foot spa combines fine furniture with technology for the ultimate pedicure experience. Audrey truly is the definition of elegance with all of the class and sophistication of its namesake yet with all of the functional requirements of a pedicure spa. Guests will receive a luxurious and relaxing hydrotherapy foot bath while nestled within the fully upholstered enclosed sides and top that offer guest privacy and sound absorption. The classic shape will enhance the architectural quality of any room and is available in different color pallets and fabric patterns. Audrey makes a gorgeous and dramatic design statement bringing with it, quality, style and innovation. The 5th Avenue Lounger has a small footprint and gives a fresh look to your pedicure area. The tilt-back feature allows for a variety of possible treatments for hands, feet and face. Also makes a great alternative for Seniors. 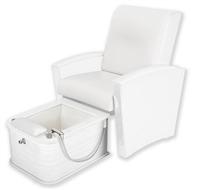 The Wilshire LE™ is a luxurious mani/pedi combo chair with a retractable, motorized, and fully plumbed pedicure bowl. The small footprint makes the Wilshire LE™ an incredible space saver and an easy replacement for those uncomfortable banquettes. Its versatility maximizes revenue through flexible scheduling for either manicures or express combo treatments. The luxurious, bespoke mid-century armchair is hand upholstered from a broad array of fabric selections and finishes. Electronic chair and bowl adjustments enable perfect client and technician ergonomics. The hidden pedicure unit features whisper quiet, reliable pipeless hydrotherapy, and is packed with practical features including a hand sprayer, power remote drain, and electronic footrest. The sweeping lines of the new Contour Pedicure Chair bring a glimpse of the past to the future of pedicure. Inspired by the retro furniture movement, our designers have created a mid-century silhouette with modern day technology. This timeless eye-catching pedicure chair brings an elegant mix of comfort and ergo style. 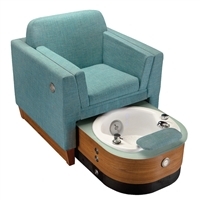 The Club LE features a retractable, motorized, fully plumbed pedicure bowl. With retracted footprint similar to that of a standard armchair. Includes luxurious strata seat cushioning, contrast double stitching, embedded control panel, milled solid surface Avonite, commercial grade chrome plumbing fixtures, adjustable electric footrest and power drain pump. Electronic chair, bowl and footrest adjustments enable perfect client and technician ergonomics. 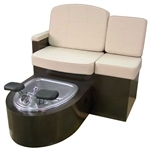 The hidden pedicure unit features whisper quiet, reliable pipeless hydrotherapy, and is packed with practical features including a hand sprayer, power remote drain, and convenient plumbing connects. DOES go over the tub. Manicure Swing Away Arms (pictured), not included. Tub finishes: Black, Dark Silver, Cream. Avonite options: High Desert, Cream, White, Star Shine. Laminate options: Black Linear, Designer White Linear, Coffee Bean Linear. Pedicure Dimensions: 50 1/4”H x 31”W. Footprint Dimensions: 35”- 57.5"L Foot Basin Height: 16.5". 110V. Genesis Spa, designed specifically to enhance a technician’s comfort while delivering high-end client features and a one of a kind raising and lowering basin and seat feature, fully customizable to cater to every technician’s comfort. Able to travel up to 10 inches, this feature reinvents the way technicians work by focusing primarily on their daily comfort. 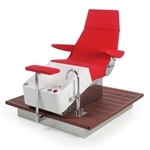 Standard with a full body Shiatsu massage with flip-out manicure trays, featuring lift-up arms accented with handsome cherry wood armrests and deeply comfortable client chair. The chair offers recline via remote control to allow clients to find their optimum comfort, independently adjustable footrests, intuitively placed controls and tapered basin shape to further encourage comfort and efficiency. Includes drain pump and technician stool in matching upholstery. Glass Bowl Options: Gold Crystal, Nickel. Cushion Colors:Sable, Latte, Cabernet, Champagne. Base Colors: Black, Almond, White. 53" L Base x 46" W (with side trays up). Position rear of base of unit at least 24" from wall to allow for recline. The Archipedigo is a stylish, comfortable and motorized Pedi-Lounge. Fingertip controls recline the top into a relaxing resting position. The motorized track system moves chair over foot tub allowing your client to easily sit down. Chair then moves back with the same push-button ease to expose tub. The Manicure Shelf quickly attaches to allow manicures while seated, not disturbing customers to relocate. 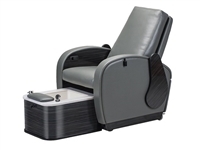 The Adjustable Foot Rest allows a soothing pedicure for the customer and ergonomic comfort for the therapist. Base colors available: Zebra Wood or Walnut. Standard Vinyl Colors: White, Almond, Camel, or Black. 110V/220V, 5-2.5 amp transformer. Seat dimensions: 24"W x 19"D. Overall dimensions/footprint: 63"L x 32.5"W x 46"H (at upright position). New! Luraco iFill 3 Magnetic Jets Now Standard! Features includes; electronic reclining back, independent rolling and kneading back massage. Genuine cherry wood veneers with industrial grade finish. Adjustable center leg support with adjacent contoured footrests position feet perfectly for a pedicure. Easy to clean and chemical resistant. A powerful no pipe jet featuring one dual jet-stream No Pipe Jet, with Air Control. Features includes; electronic reclining back, independent rolling and kneading back massage. Genuine cherry wood veneers with industrial grade finish. Adjustable center leg support with adjacent contoured footrests position feet acrylic backed with multiple layers of fiberglass for extraordinary strength and durability. It is also almost three inches deeper than the original acrylic basin! Features integrated foot support with river stone texture. Standard Upholstery Colors: Almond, Cappuccino, Burgundy, Chocolate, Black. Curved Base options: Natural White, Select Cherry, Espresso Pear, Satin Stainless Laminate. 61.72” L x 29.5” W x 52.5” H. 120V AC, 15 Amp, 60HZ. A separate and dedicated 15 Amp GFCI protected circuit MUST be used for each foot spa. Installed by General Contractor. If pedicure spa ventilation is required in your area, the Echo LE, Echo SE or Vantage VE may be ordered with a vented-air option. Two (2) vents are located within inches of the pedicure footrest area. When connected to an external HVAC system (required, but not included), toxins and odors are vented outside of the building. Provide a safe and relaxing environment by improving the air quality in your salon. Features the durability of “Hard Roc” glass bowl, a stylish curved base, flip-up arm rests and full shiatsu massage chair.